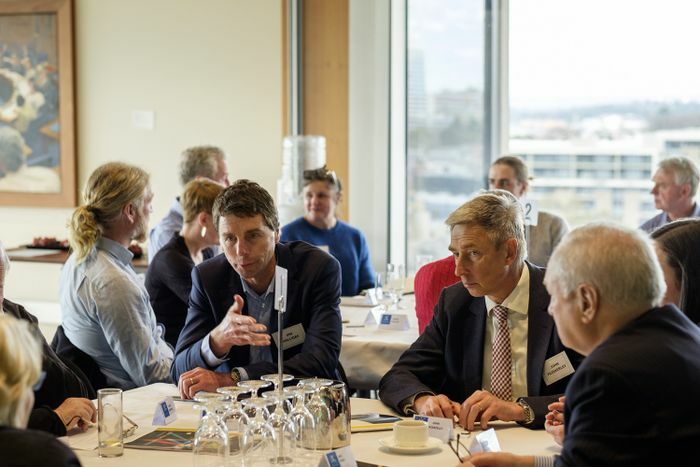 School of Agriculture and Food staff were joined by 18 guests including Dairy Australia CEO Ian Halliday, Weekly Times publisher Ed Gannon and Bill Lewis of the Agriculture Institute. The student body was represented by second-year BAg students Eliza Redfern and Jocelyn Martin, and Diploma in General Studies students Harry Goy and Chelsea Hall. Dairy Australia CEO Ian Halliday (left) and FVAS Dean Professor John Fazakerley (right) discuss curriculum with Director (Dookie) Ros Gall (outside shot). Photo: Stuart Winthrope. Seek support from our partners in the agricultural sector to enhance industry engagement through the curriculum, particularly for students in the third year of the new BAg. Following a welcome from the Dean, Associate Dean (Curriculum Development) Liz Tudor described the rationale and process followed during the BAg curriculum renewal. Weekly Times publisher Ed Gannon (left) and Faculty Business Development Director Greg Harper (right). Photo: Stuart Winthrope. 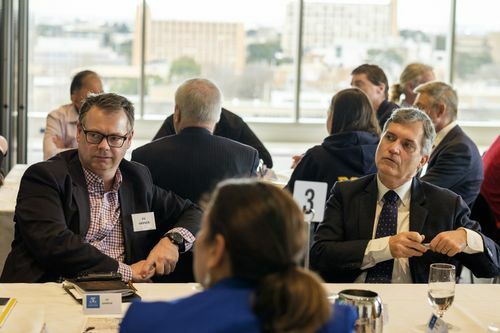 Brian Davidson, Director (Learning and Teaching) in the School of Agriculture and Food, introduced the new program and invited Sarah Frankland, Michael Santhanam-Martin and Ros Gall to provide updates on curriculum initiatives in each of the three years of the degree. During the round table discussion that followed, guests strongly endorsed the structure and goals of the curriculum renewal, and provided valuable feedback on opportunities for further industry engagement of our students, particularly in the planned third year capstone subject. Story and banner image by Stuart Winthrope.